Sulfide chondrules, a new type of building blocks discovered in meteorites left over from the solar system's infancy, provide evidence for a previously unknown region in the protoplanetary disk that gave rise to the planets including Earth. A research group in the UA Lunar and Planetary Laboratory has found evidence in meteorites that hint at the discovery of a previously unknown region within the swirling disk of dust and gas known as the protoplanetary disk – which gave rise to the planets in our solar system. Led by Kelly Miller, a doctoral student in the lab of Dante Lauretta, the principal investigator of NASA's OSIRIS-REx mission, the team has found evidence of minerals within meteorites that formed in an environment that was enhanced in oxygen and sulfur and date from a time before the particles stuck together, or "accreted," to form larger bodies such as asteroids and planets. 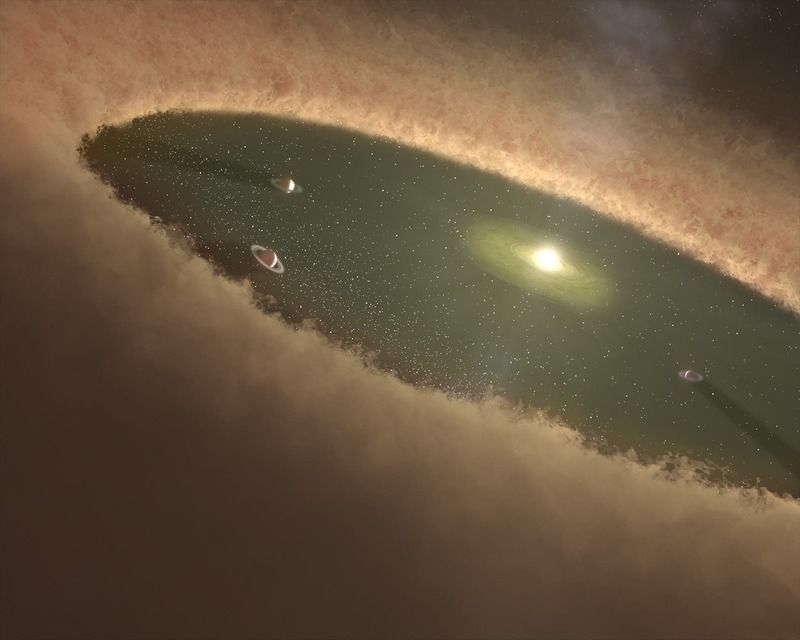 The elements that later went on to constitute the major ingredients in life on Earth – such as carbon, oxygen, nitrogen and hydrogen – originated as volatile gases in the protoplanetary disk when the solar system was less than 10 million years old, Miller said. "If we want to understand how those elements contributed to life, we have to understand where they occurred at the time the solar system formed," she said. Miller and her team study meteorites called chondrites, which are thought to be the most primitive leftovers from the birth and infancy of the solar system about 4.6 billion years ago. They derive their name from their main component – chondrules, which formed as molten droplets floating in space. "We think that chondrites represent the earliest building blocks of rocky planets such as Earth, Mars or Venus," Miller said. Specifically, Miller and her co-workers studied sections about half as thin as a human hair that were cut from R chondrites, a rare type of meteorite so named after the location where the type specimen fell: Rumuruti in Kenya. R chondrites are thought to have formed somewhere between Earth and Jupiter. In one specimen, found in Antarctica, they discovered a new type of building block called sulfide chondrules. The samples were obtained from the U.S. collection of Antarctic meteorites – a cooperative effort among NASA, the National Science Foundation (NSF) and the Smithsonian Institution. 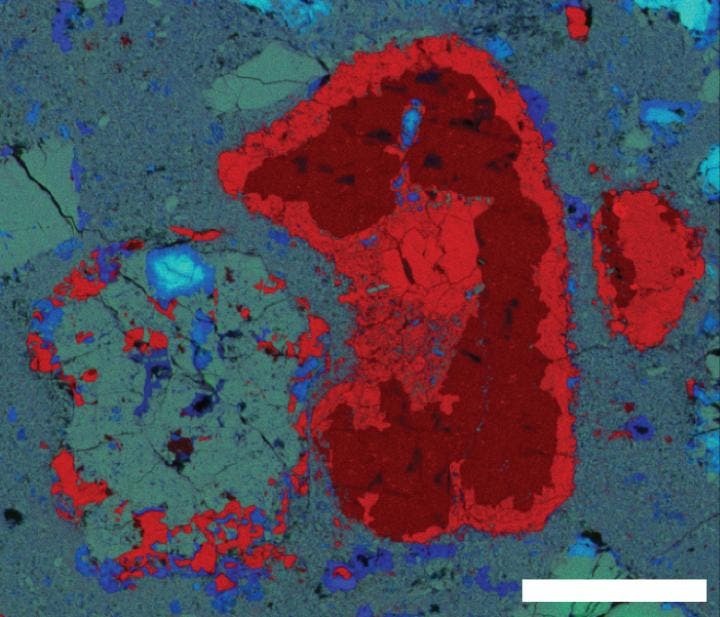 "Generally, chondrules are made up of minerals rich in silicon, but the chondrules we found in this meteorite are completely different in that they are composed of sulfide minerals," she explained. "This suggests that they formed in a region that was rich in sulfur, and provides evidence for a previously unknown type of environment in the early solar system." "Our discovery of the sulfide chondrules will help us put a quantifiable number on how much sulfide was enhanced in that region of the protoplanetary disk," Miller added. Obtaining a better understanding of the distribution of gases in the early solar system has been identified by the Planetary Science Decadal Survey as a primary objective for the study of primitive bodies. Published by the National Research Council for NASA and other government agencies such as the National Science Foundation, the document identifies key questions in planetary science and outlines plans for space- and ground-based exploration ten years into the future. "What is exciting about this sample is that it has not been heated to high temperatures and thereby altered in its composition," Miller said. "We know it's a fragment of a larger asteroid, and some of that asteroid heated up to higher temperatures, erasing the signature of the original building blocks of the asteroid, but our piece retains the original building blocks." "These sulfide chondrules help us pin down when and where that sulfur enhancement occurred and help us better understand the process," she added. To learn more about the early stages of the solar system including the origin of the building blocks of life and water, the UA-led OSIRIS-REx mission is getting ready to launch a robotic spacecraft to asteroid Bennu in 2016 and bring a sample of at least 60 grams of pristine material back to Earth for study. The mission will provide ample amounts of sample material and, most importantly, from a known context. "Unlike with meteorites that came to us serendipitously and we're lacking the context of where the material formed, with OSIRIS-REx we will know exactly where that piece came from, and we will know the travel history of Bennu – where it has been in the past," Miller said. To learn more about Bennu's past and the OSIRIS-REx sample return mission, visit the OSIRIS-REx Website and watch the short documentary, "History of Bennu". Image credits: lanet to grow.